This series, coordinated by Jan-Åke Jönsson, seeks to inform readers, explore new ideas, and promote discussion on themes related to developing countries and emerging analytical communities. If you wish to contribute to this series, please contact Jan-Åke Jönsson <jan_ake.jonsson@analykem.lu.se>. Articles in this series are available from <www.iupac.org/publications/ci/indexes/emerging-issues.html>. Can Ambiguous Terminology Cause a Barrier to Trade? Trading in and between developed and developing countries is an exchange process in which both parties must have a clear understanding about the value of the goods being traded. A primary means of establishing the quality of goods is through measurement. However, there should be mutual trust in the measurement results to sustain a successful trading partnership. This obvious requirement can often cause problems for developing countries when they are trying to export raw materials, food products, or manufactured or processed goods that have to satisfy high import standards in order to “protect the consumers.” This is especially true in trade with developed countries that may believe, rightly or wrongly, that they have more sophisticated measurement methods and better trained staff. The end goal must be to have the definitions of all basic concepts in all major languages of the world. For that, there must be worldwide agreement on chemical measurement concepts and terms in a single language because terms are in reality labels for underlying concepts. Thus, the concept must be unambiguously defined first, then a term must be allocated to the concept. “Quantity” is defined as “attribute of a phenomenon, body or substance that may be distinguished qualitatively and determined quantitatively.”1 Thus, in chemical measurement, “quantity” is “concentration,” “content,” “amount-of-substance fraction,” or “mass fraction.” But “quantity” is also used by chemists colloquially to mean “amount.” Thus we often talk ambiguously about a “quantity of sample.” If we want to express “how much of a substance there is,” then the term “amount” should be used to avoid confusion. The definition of “measurand” is “quantity subject to measurement.”1 This could be interpreted in many chemical measurements as meaning “electric current” because that is the output of the instrument. It has been proposed in VIM3 that measurand should be defined as “quantity intended to be measured.” This will be more suitable for chemical measurements as the analytical chemist aims to determine a “concentration,” not just the electric current from the spectrometer. “Measurement result” poses particular problems. Is it a numerical value times a unit? Is the inherent uncertainty of the measurement result also part of that result? If a measurement result contributes to an important decision, its definition is very important. 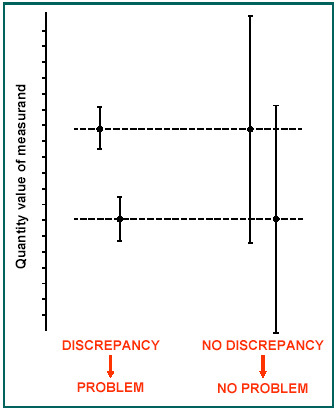 Discrepancy problems are mostly caused by lack of full evaluation of measurement uncertainty. It is important when comparing measurement results from developed and developing countries, that the measurement uncertainty associated with each result is evaluated in the same way. Otherwise results that are equivalent may appear to differ, casting doubt on the reliability of one of the laboratories. That may lead, in the worst case, to customs officials refusing the entry of what should be acceptable goods or produce. Common evaluation procedures (according to the ISO Guide on the Expression of Uncertainty in Measurement, i.e., GUM) should be used in the evaluation of all measurement results by all laboratories, whether located in developed or developing countries. The term “traceability” was almost unheard of several years ago, but it has dramatically invaded oral and written language as one of the newer buzzwords. However, what does it really mean? Does it refer to traceability of the sample, of the accompanying document, of the accompanying certificate, or of a measurement result, the really important feature in measurement? “Metrological traceability” is proposed in VIM3 as a more specific term for the traceability to a common metrological reference: to a value embodied in a certified reference material, to a common measurement unit, or to an internationally agreed measurement procedure. This relationship is important when a comparison between measurement results from different countries is made, as measurement results are only comparable when their metrological traceability has been established beforehand. Only then can we decide if the results obtained on one sample from a material batch indicate a larger concentration of a given substance than the results obtained on a sample from another similar material batch. For example, is one used-car exhaust catalyst revealed to contain a larger concentration of a valuable platinum metal (Rh or Pt) than that concentration in another car-exhaust catalyst, and can the first material therefore be priced higher? Similarly, the concentration of cholesterol for a person traveling in different countries may seem to be different, but is not (see figure). This can lead to incorrect treatment. The difficulty for developing countries is also that they can be at a disadvantage in trade as their measurement results may be considered dissimilar to those from other countries because even the term “comparability” is used ambiguously: Most of the time it means “being of the same size” rather than “can be compared because traceable to the same reference,” regardless of size. All of this generates confusion, and even more so for the non-native English-speaking person. Certified reference materials required for the comparisons may also be prohibitively expensive in developing economies and, hence, difficult to justify. Worse, commercial organizations may offer reference materials embodying values that are “traceable to an institute,” but that does not show by itself that these values are metrologically traceable to a common, internationally agreed metrological reference needed for any scientifically valid, intercontinental comparison of measurement results. Although the UK and the USA are often said to be countries “divided by a common language,” this is no longer acceptable in the analytical chemistry laboratories of developed and developing countries. In order to have “fair trade,” they must be united by a common [measurement] language and by common understanding of the concepts and terms labeling these concepts in that language. Only after this is accomplished is it worth putting time and effort into translating these terms into 30–40 (or more?) of the world’s other languages, an obvious necessity. Useful comments by René Dybkaer are gratefully acknowledged. The author also thanks the series editor Jan Åke Jönsson, as well as Roger M. Smith, secretary of the IUPAC Analytical Chemistry Division, for their comments and input. This contribution was approved for publication on 20 May 2005, World Metrology Day—a salute to all interested in Metrology! 1 BIPM, IEC, IFCC, ISO, IUPAC, IUPAP, OIML, International Vocabulary of Basic and General Terms in Metrology, 2nd edition, VIM2, ISO Genève (1993); a revised edition (leading up to VIM3) is expected shortly. Paul De Bièvre <paul.de.bievre@skynet.be>, a long-time member of IUPAC, is an independent consultant on metrology in chemistry based in Belgium. He is currently a member of the Interdivisional Working Party for Harmonization of Quality Assurance of the IUPAC Analytical Chemistry Division. Page last modified 30 August 2005.